Submitted by ajasaro on Wed, 01/18/2017 - 1:53pm. 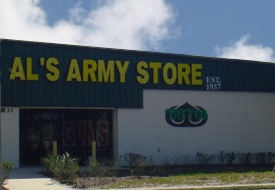 Military surplus stores located in the United States. They carry everything from clothing to tents, camping equipment,ammo, etc. Always interesting places to browse, you'll never know what you'll find. Added several Pennsylvania locations and corrections. BIG THANK YOU to ajasaro !!!!!! Made corrections and added Janesville, WI location. Thank You to Don B ! Corrected the errors in today's previous upload. Also eliminated duplicates. Apologies for any inconvenience.